Who are the prison cells for? It looks as if the criminal case against former governor of the Donetsk and then Sumy oblasts, Volodymyr Shcherban [see photo] will be closed. It could be said this man represents the worst aspects of the first 15 years of independent Ukraine - I've posted about his grim past previously. The deputy chief of the press- service of the Attorney General's Office has stated that, "The investigator has prepared a project on the decision to close the criminal case against Shcherban, but the final decision will be made after Deputy Attorney General Renat Kuzmin's operational conference [and presentation] of his report to the Attorney General", When asked when this conference will take place, he replied: "Soon, maybe today, maybe tomorrow. " Incidentally, Kuzmin's is another name to 'conjure' with. The 'Donbass' piece includes this: "On the basis of the tendencies in today's law enforcement system, it is possible to say with practically hundred per-cent confidence that Shcherban will be left in peace. And not only him - there is another question - will the cells prepared for these people remain empty? Or will they be occupied by those who are in the opposition today? Hopes that the power structures will be diverted from politics and will concentrate [only] on crime fighting are decreasing." If even 'Donbass' are writing this kind of thing, then everyone should be concerned. The piece ends with a quote from former Minister of Internal Affairs Yuriy Lutsenko: "I am not at all surprised at this course of events. Today the law enforcement system, which previously sabotaged the investigation of such matters, has been combined with the new management if the Ministry of Internal Affairs, and has returned to being an effective washing machine for the Mafia." PoR's offer spurned last spring..
During discussions following the March 2006 VR elections, Yanukovych was prepared to forgo the position of PM and accept the VR speaker's chair. "I agreed at first to stand for election as head of the VR, I understood that president Yushchenko does not want me to be PM." said Yanukovych in an ICTV interview today. "And in order to stabilise the situation and somehow unite the people and Ukraine, I convinced my friends, party colleagues and fractions during complex discussions, that we have to go for this. And by force I achieved agreement, as they say, on the fringes of what was possible." At the same time, the president's side did not take advantage of this. "Probably not him [the president] but his colleagues from NU," said Yanukovych, adding, "at that time this alternative would have been good for them, an acceptible alternative, the PM would have been Yuriy Ivanovych Yekhanurov. We agreed with his candidature, we had, and still have a good relationship with him." LEvko assumes that the cabinet ministers appointed at the prerogative of the president, including the ministers of foreign affairs and defence, would have been in place too. Yekhanurov had been president Yushchenko's chosen PM after he had dismissed Yuliya Tymoshenko in September 2005, when Yushchenko still possessed all the enhanced presidential powers passed on to him by Kuchma. Bearing in mind that in the March 2006 elections 186 PoR deputies and only 81 NU deputies were elected to the VR, this was a 'cracking good' offer. It indicates how much PoR's backers were prepared to give away in order to have influence on government, and partly explains why they now have so little time for the president. Yanukovych rather let himself down later in the interview when he said, "We will not permit people to stick pins into our wheels at various levels. We will knock off the arms of those who will do this...We are fighting for there to be order in the country." He also suggested that there is a possibility that the next president may be elected by the VR. Bogatyryova calls upon Yushchenko to discuss "alarming tendencies" as soon as possible. The coordinator of parliamentary majority and leader of the PoR faction in the VR, Raisa Bohatyryova considers that the President Yushchenko should meet with the leaders of parliamentary fractions as soon as possible. "We are again approaching the dangerous possibility of deepening national division. Parliament is being artificially used - the opposition is systematically developing its plan. In this situation the President should meet the leaders of parliamentary fractions as soon as possible," said Bohatyrova. The coordinator of the VR majority considers that the crisis in the VR has been artificially created. In her opinion, "the opposition forces, which unfortunately includes the presidential NU, are destabilizing its work, and have as their obvious aim the breakdown of the work of the highest legislative organ and government in order to provoke a general national political crisis. The plan is that this campaign will culminate in early parliamentary elections. " The coordinator of parliamentary majority called on the President to discuss the present alarming tendency as soon as possible, adding: "We are definitely ready for any early elections, both ideologically, and also financially, but is the country ready for this? I'm sure it will not change anything - not even the doomed ambitions of our opposition. Moreover, it will impact painfully on the economy, since huge sums of money would be spent on elections which otherwise could be directed toward reforming the housing and lame social sector." According to her: "We should speak right now about the problems in housing and utilities services sector, since the impression being given is that this branch of the economy never existed, and now only the anti-crisis coalition is guilty for all its sins. We have never avoided responsibility, but we consider that the problems involved in the housing and communal services sector are complex in nature and require the coordinated and joint efforts of all branches of government." Bohatyryova also said, "We must speak to the President about a compromise version of the law "On the Cabinet of Ministers of Ukraine", about the VR rules of procedure [reglament], and about the imperative mandate for deputies of local councils. I am certain that the branches of the Ukrainian authorities must renew the dialogue that existed earlier, when vital decisions for the country were approved as a result of consultations and combined actions." She appeals to the president for more consulations over the appointment of a new minister of foreign affairs and head of SBU [the VR rejected the president's proposed candidates Ohryzhko and Korol recently] declaring, "We don't want to give out negative signals to the international community by rejecting Ohryzhko and Korol for a second time. The institution of the presidency of Ukraine should appear strong and responsible for stability of the state in the eyes of the international community." Bohatyryova is regarded are the mouthpiece of the new Donetskiites, close to Akhmetov. After the death of Yevhen Kushnaryov in a hunting accident, she is probably PoR's most able front-man. I suspect the thinking is that maybe they've pushed the pres. too hard in recent times, and do not want to risk more uncertainty at the moment. Today BYuT and NU joined forces again 'as an united opposition'. "On February 21 in Sevastopol, the Mayor of Moscow Yuriy Luzhkov [see photo] publicly dared [to] called[?] in[to] question the status of the Crimean peninsula as a part of Ukraine. Currently, when the Ukrainian – Russian relations are gradually released from ideology and stereotypes of the past by common efforts of the Presidents of Ukraine and Russia, the statements of the Russian regional figure may not be qualified otherwise but as an intended action aimed at detriment of this positive progress. Obviously without any authority to say[?] [speak] in the name of Russia, Mr. Luzhkov pronounced simultaneously [?] [suggested that] as if this neighbor country does not intend fulfilling its international obligations particularly fixed in the basic agreements on temporary disposition of the Black Sea Navy of the Russian Federation in the territory of Ukraine. In addition, contrary to the mentioned basic agreements, Mr. Luzhkov took part in unveiling of the so called Moscow House built in the territory of the military unit leased by the Black Sea Navy of the Russian Federation. Special anxiety is also aroused by the public summons [?] [appeals] of Mr. Luzhkov to Ukrainian citizens to take part in mass actions of political nature which is direct interference in internal affairs of a foreign country. The Ukrainian party regards the events occurred in Sevastopol as a step aimed at forcing stress [raising tension] in the society, detriment [undermining] of good neighborly relations and strategic partnership between Ukraine and Russia. We hope that such actions of the said official will be properly assessed by the Russian authority which will be informed to the Ukrainian party. For its part, the Ukrainian party reserves the right to resort to appropriate measures, being guided by the current legislation that provides making decisions for the purpose of preventing foreign citizens from arrangement of preconditions for committal of unlawful manifestations associated with infringement of territorial integrity and inviolability of Ukraine." Petro Poroshenko, one of the 'lyubi druzi' has been elected chairman of the National Bank of Ukraine council. [nice work if you can get it] Several days ago he was declared a 'persona non grata' and was prevented from entering Russia. He won't be 'doing a runner' [run away from a crime scene] with the money there then. President Putin also sent his 'Mnogaya Lyeta' wishes. He expressed: "confidence that further close co-operation grounded on the principles of good neighbourliness, long term strategic partnership and pragmatism, will serve the fundamental interests of the Ukrainian and Russian nations." In his 'thank you' note maybe pres. could mention the awkward matter of Luzhkov, and oh, put a word in for his 'kum' - godfather of his off-spring, Petro P.
The ruling anti-crisis coalition has turned to president Yushchenko to sort out the mess in the VR caused by opposition deputies continually distrupting its functioning. They must be getting desperate - they have been busily dismantling his powers for months. "The opposition have 'requalified[?] themselves into hooligans and bandits, and are utilizing populist slogans again," said indignant PoR fraction member Mykhaylo Chechetov. He expects law enforcement agencies will "provide an appropriate assessment of their actions." Yesterday the deputy VR speaker, Adam Martynyuk announced that the 15 BYuT deputies who took control of the electricity switch gear panels in the VR building and who were switching the lights on and off [playing 'pretend thunder and lightning'?] would be criminally responsible for their actions. "I do not recommend you joke with this matter," he warned, rather unconvincingly. The opposition are ostensibly demanding an emergency debate on the big housing and communal charge price hikes that have hit the country's citizens in recent days. A Reuters report quotes opposition leader Yuliya Tymoshenko on the struggle between the PM and president: "This chaos has one name only: a constitutional crisis, when the president and the prime minister ... confront each other and their powers contradict each other. So Ukraine has ended up with two masters wielding executive power." "There is only one way out of the constitutional crisis, the same used by all democratic countries when such a situation occurs, and that is an early parliamentary election," she said. According to Serhiy Teryokhin, one of Tymoshenko's closest associates and former economics minister in her cabinet, in the event of early elections, despite their current rapprochement, it is hardly likely that NU and BYuT will come together on one list. "I can say the exasperation inside BYuT with the actions of individual members of NU is just too great, and unfortunately is not reducing with time. The hope that 'the dear friends' will give up their further political careers is an illusion." He also says Yuliya T. is undecided whether to stand for election in the 2009 presidential elections. It depends on how the constitutional reforms pan out. So now it is clear what BYuT are really after. First crisis for the anti-crisisites? Problems surrounding this winter's massive increases in communal housing and services charges have now developed into a full-blown crisis for the government. Unofficial figures reveal that a majority of citizens have delayed their payments to their local councils, and now the VR being blockaded for a second day by opposition deputies demanding a debate on this subject. Yanukovych and the anti-crisisites have tried to defuse the crisis by proposing the formation of a working group to check if the increases are justified, and are blaming oblast councils, most of which have an 'orange' ruling majority, for the increases. In Kyiv, BYuT have succeeded in their local campaign to ensure the proposed draconian tariff increases be rescinded, and have no doubt earned many political 'brownie points'. Now an article in today's big-selling, normally PoR-leaning 'Donbass' newspaper throws down a challenge to the anti-crisisites. "Kiev has decreased its tariffs, now what about the regions? Thursday 8th February was a good day for millions of inhabitants of the Ukrainian capital. For the first time, in the largest city of our country, tariffs were reduced. Credit for this belongs to the BYuT-organized campaign, which even the pro-authority fractions were forced to support in the local council. The experience of Kyiv is of interest to the majority of large industrial centres, having similar problems with payment for public services, whose costs have recently rose dramatically by three or four times. Strictly speaking, there are no economic reasons for this increase, which the special commission created at the initiative of Yulia Timoshenko's block, could convincingly prove. The chairman of commission Aleksandr Klyus (BYuT) declared that tariff increases in Kyiv were not only economically without foundation, but were also illegal, since the capital's authorities was obliged to register them with the Justice Department. From the first days of December the mayor of Kyiv had received repeated warnings from the prosecutor's office that the city authority were not adhering to procedure by increasing the tariffs. Simultaneously the opposition called upon Kyivites to on no account pay the new tariffs. A payment strike was called and the inhabitants of Kyiv refused to pay not only the new, but also at the old tariffs, waiting to see what the final charges would be. On 8 February the united pressure of opposition, prosecutor' office and millions of townspeople who objected to pay the ridiculous charges, produced a result - 113 deputies of the KyivRada (including even the mayor's fraction) voted for a two-fold decrease in the proposed tariffs. As a result, Kyiv's tariffs became almost the lowest in the country. However, Kyiv is not not the only case where it has been possible to overcome the baseless tariff increases and to restrain the greediness of those who raised them. The same has happened in the small town of Bliznyuki in the Kharkiv region. The almost completely agrarian nature of this area precludes the possibility of large inflows into the local budget. Nevertheless, in first year of activity the mayor of the town, Gennadiy Korol restored the central water supply, is repairing roads, and has even managed to turned on the street lighting which has been out of action since 1995. In not even a full year of activity the mayor conducted 20 gatherings of the inhabitants of settlement. In contrast to other places, tariffs in Bliznyuki have not been raised by one kopeck. Money for the urban budget has been raised, according to the mayor, by staging open auctions for the sale of land and previously neglected municipal property. The city authority conducted meetings of urban 'mikrorayony' almost in each building. Inhabitants began to pay directly the charges for financing public utilities and amenities, thanks to which the quality of services, and control by users immediately were improved. Significantly, the mayor Bliznyukov was elected with the support to the opposition, Yuliya Timoshenko's block. But those who always protect any actions of authority could say, in such a small town, or in the capital, the tariff increases can be challenged, but in medium-sized towns, where most people live, it's more difficult. Aleksandr Mazurchak, Kamyanets-Podolskiy [Khmel'nitskiy region] city head would not agree. He described the striking results of his authority's activity when he addressed the BYuT forum of local council deputies recently. Thus, in million+ city of Kyiv, in a hundred-thousand population city, and in the small town, in the center, in the east and West of the country, the opposition has managed to constrain the appetites of those who attempt to tear out a tripling of prices from the pockets of fellow citizens. What's going on in your city, dear reader?" LEvko says there are big probs with crumbling khrushchovka apartment blocks all over Ukraine - there are no easy fixes, particularly were town councils are so corrupt. Resident's associations sound like a good idea. One of the biggest Russian metals companies is in talks with a Ukrainian rival to form an iron and steel giant worth up to $20 billion (£10.3 billion). Gazmetall, which is half-owned by Alisher Usmanov, one of the wealthiest men in Russia, is negotiating a merger with the Industrial Union of Donbass (IUD) to create a company capable of producing 20 million tonnes of steel a year. The new company could overtake SeverStal, which is controlled by the billionaire Alexei Mordashov and is the biggest Russian steelmaker, producing 17.6 million tonnes annually. Officials at Metalloinvest, the company that manages Gazmetall’s assets, confirmed that discussions with IUD were taking place. The newspaper Kommersant, which is owned by Mr Usmanov, reported that a letter of intent had been signed and that Gazmetall would control the merged company. Maxim Basov, the chief executive of Gazmetall, said that the companies had agreed to "tighter commercial, financial, investment and strategic cooperation". Merger proposals are being examined and will be put to shareholders within months. Mr Usmanov has long advocated the creation of an iron and steel conglomerate combining assets in several republics of the former Soviet Union to compete worldwide. Metalloinvest company strategy holds that a Eurasian mining and metals company with facilities in Russia, Ukraine and Kazakhstan would "not only enhance the effectiveness of the industry and attract large investments, but also enable it to become a world leader". Gazmetall already controls 40 per cent of Russian iron ore production and its plants turn out more than six million tonnes of steel a year. Mr Usmanov and his partner, Vasili Anisimov, tried to add Magnitogorsk Metallurgical Complex, the largest ferrous metals producer in Russia, to the group in 2005 but were rebuffed, despite blocking supplies of raw materials to the plant for a time. IUD produces more than nine million tonnes of steel at three plants and is the second-largest corporation in Ukraine, with net profits of $390 million in 2005. The merged company would produce 15 million tonnes of steel annually and 38.1 million tonnes of iron-ore concentrate. IUD also owns steel plants in Hungary and Poland." I have posted previously about how battles between Ukrainian financial industrial groups, in particular Rinat Akhmetov's SCM and IUD, have forced IUD to purchase iron ore from Brazil. IUD's problems may have been of their own making. SCM, who have a surplus production capacity of iron ore had agreed to supply IUD with ore in 2005, but IUD pulled out of the deal having commenced negotiations to purchase 'Pivdennyi' ore enrichment plant from Ihor Kolomoyskyi's 'Privat' group. IUD had used the agreement with SCM to drive down the purchase price of 'Privat's plant. When the deal with Privat fell through, IUD were left high and dry, and Akhmetov's SCM had lost the order for about $50m of iron ore, for which Akhmetov could not forgive his rival, IUD. But recently, Akhmetov and IUD's co-owner Serhiy Taruta flew together in the former's jet to to the recent world economic forum in Davos, and Akhmetov claimed they get on well. SCM's surplus iron ore production capacity will probably be 'mopped up' by their own planned increase in the production of steel. The merger with Gazmetall and Usmanov may put IUD back in the driving seat. Perhaps this is why Vitaliy Hayduk, the other co-owner of IUD, has 'snuggled up' to the president and become secretary of the NSCD recently. He doesn't want anyone to mess up the deal. Is the Gazmetall deal good for Ukraine if it comes to fruition? I say there is no harm in honest competition in a tough marketplace. ps Minister of Justice Oleksandr Lavrynovych has stated that reports he was recently assaulted by Yanukovych are all lies. "The exact truth is, as I see it, is the journalist who put this into the newspaper must have had a [surgical] trepanning of the skull performed on him, and his brain replaced with a special device for spreading muck all over the country." What a peculiar and vivid turn of phrase..Caused by after-effects of concussion? Medication? Possibly post-traumatic stress disorder? 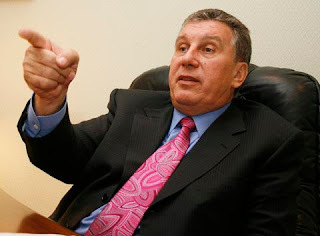 And Ukrainian communist party leader Petro Symonenko is in hospital for treatment of a heart problem. There is no truth that he was beaten up by PM Yanukovych - Speedy recovery Pyotr Nikolayevich! Rinat Akhmetov's SCM company has decided to participate and compete in the purchase of a 10% share of Ukraine's largest land-line telecom company, state-owned monopoly "Ukrtelecom". Akhmetov revealed his intention after an announcement by the State Property Fund to float 10 percent of shares of the company on February 21st on Ukrainian exchanges. SCM's final decision will be made after details of the partial privatization offer are revealed. It is intended that around a further 33% be released for sale on foreign exchanges at a later date. President Yushchenko has suggested that a controlling packet of shares should be sold to encourage large European and other investors to bid, but Ukraine's State Property fund have apparently decided that only 10% of shares will be released at the moment, the rest remaining under the State control. Foreign investors would be more interested to buy if they could secure at least a blocking packet [25 or 30%] of shares. The value of the whole company is estimated to be $4-$5Bn, but a 10% portion would be worth at a minimum 40% less than $400m, so this looks like another dubious sale that could well benefit SCM if and when more shares become available. But least it keeps the Ruskies out. Rinat Akhmetov is Ukraine's richest man and PoR's main financial sponsor. There are dozens of deputies closely linked to him and to SCM in the Verkovna Rada. I've not seen any comment yet from Yulka T. about all of this.. Playing footsies under the table? "PRESIDENT VIKTOR YUSHCHENKO HAS SIGNED A DECREE CONFERING THE ORDER OF YAROSLAV THE WISE, 3RD GRADE ON EX-PROSECUTOR GENERAL MYKHAYLO POTEBENKO FOR HIS SIGNIFICANT CONTRIBUTION INTO CONSTRUCTION OF LEGAL UKRAINE, STRENGTHENING PUBLIC ORDER AND PAINSTAKING WORK ON THE OCCASION OF HIS 70TH BIRTHDAY." This is the man who has been called the living embodiment of Kuchma's law enforcement system. Potebenko was a central figure in the investigation of former energy minister Yuliya Tymoshenko when she was sacked 5 years ago having been accused of fraud, and in the scandal and subsequent cover-up of the disappearance and murder of journalist Georgy Gongadze. Not in the face..Not in the face..
Before the O.R. PM Yanukovych was well known to be a man in possession of 'a useful pair of fists.' There have been reports that he may be experiencing difficulty controlling his temper again. An 'informed source' from the KabMin secretariat says that recently the Minister of Justice Oleksandr Lavrynovych was the first to experience 'the treatment' when he was summoned for a 'dressing down'. Yanukovych is alleged to have 'hit the minister in the rib cage, and when he fell, hit him in the kidney area'. The minister then ran out of the PM's office and left the building without even picking up his coat from the cloakroom. Later KabMin minister Anatoliy Tolstoukhov [literally Mr Thickear] was also summoned on the carpet, but this time it is said he was just hit in the liver by the PM, allegedly for failing to publish the law on the KabMin on time. Lavrynovych's press secretary has denied that his boss was even in Kyiv when the incidents were supposed to have taken place..
And at yesterday's NSDC meeting chaired by the president and attended by Yanukovych and half of the cabinet, the proceedings were distrupted by the ringing of someone's mobile phone. It turned out the phone belonged to deputy PM, and Minister of Finances Mykola Azarov, who was admonished by an annoyed president rather in the manner of a lecturer telling off a pupil. Azarov sheepishly opened up his briefcase and turned off the 'phone. Embarrassingly [hee..hee] for him, the whole incident was recorded - you can watch the video-clip here. The current 'Profil' weekly magazine carries an interview with a distinguished former strategy analyst, Serhiy Dyachenko, who has worked for the Ukrainian NSDC, presidential secretariat, and 'MinTopEnergo'. In it he is questioned about the purchase by Russian oligarch Viktor Vekselberg of Ukrainian regional and city power utility and gas transport companies [Gorgazy], and how this may increase Russia's control of Ukrainian industrial enterprises. "I do not see a danger to the national security of Ukraine. A lot of fuss has been created because this question has been politicized. If we put aside the politics, what conclusions can we make from this story? What will be the consequences for Ukraine of similar policies by Russian business? It is necessary to expect attempts of privatization of Ukrainian defence enterprises by them or of "UkrTelecom", such factories as "Yuzhmash", "Motor-Sich" and others. Russians will try to include them in its technological chains. For them it is expensive to build their own new plants, and so naturally, there will be questions of property as well. As a matter of fact, Russia offers Ukraine a choice: either she becomes her close technological and political partner in the next few years, or their relations will be transferred onto the plane of relations that already exists for other independent economic partners. And the price for gas from the monopolist supplier Russia, will be absolutely different [to that which exists today]." Several days ago Russian President Vladimir Putin’s held his annual meeting in the Kremlin with the owners of Russia’s largest companies. He requested they develop and upgrade Russia’s industrial base, diversify the economy and prioritize high value-added activities. The newly appointed Russian defence minister Anatoly Serdyukov, is to mastermind an eight-year arms modernisation programme. According to Akmetov "There cannot be any talk of union of the parties [PoR and BYuT] in the anti-crisis coalition. I spoke only of a situational [?] union." In order to pass a decent law on the opposition, "We are ready to collaborate with BYuT. Certainly, we could pass this law without BYuT, we have enough votes. But, this would surely be incorrect - nevertheless it is that party that today is in opposition." Akmetov used footballing metaphors to explain his views. "In football we want a strong, honest and competitive championship. Then our teams will grow and can worthily compete in Europe. In football there are rules of game which I may not like. I can curse at the referee, and curse those that devised these rules, but nevertheless I will obey the rules of game." I am convinced that this is correct for our politics," noted Akhmetov. "First, it is necessary to establish the rules, secondly, it is necessary to learn to play according to the rules. Then we obtain strong, honest, competitive politics and politicians ." He emphasized that it is necessary to take into account that: "We are now creating rules in earnest, and for a long time forward." Today Rinat Akhmetov told journalists: "When two forces [PoR and BYuT] come together for the sake of values which take the country onto a qualitatively new level, I accept this positively." At the same time he rejected the possibility that BYuT and PoR joining together in the Anti-Crisis-Coalition, or uniting on one electoral list. "BYuT cannot unite with us. We have simply combined [our efforts]. Of course there cannot be one list," noted Akhmetov. He also added, "Yuliya Volodymyrivna is a powerful politician - she has her opinions, we have ours. We are not going to unite our parties - that's nonsense." Another article which caught my eye, entitled "War and peace - The main conclusion of the O.R." in 'Obozrevatel', develops the idea that Ukraine is becoming a politically bi-partisan state. "The main conclusion of the of the last two and one half years seems to be the that the revolution, turned out to be quite painless. No one (practically no one) was killed apart from "suicides" caused as consequence of fear, and not real threat. Promised wars did not take place, Lviv met Yanukovych [during his recent visit] peacefully, and Donetsk quietly accepted Yushchenko. Everyone has settled down. After fulfilling his historical function - uniting the entire people against himself - the acting President has became superfluous. The stunning failure in 2006 of NU (a party that is a mere bluff, a chimera, that has politically 'fizzled out', split by internal divisions between the betrayed, and betraying), and also of national Litvinites, has shown that in a country no longer frightened, there's a demand nowadays only on the fringes for such parties. There is left-of-centre Yuliya, who is always gaining points, and our right-of-centre leader (for the moment), who has learned by his errors, having mastered the skill not only to go for the break-through, ensure unity and demolish his enemies, but to also to depict solid respectability, and be prepared for co-operation, compromise, and tolerance. Other minor parties will die out even more rapidly than their electorate, so it is only those two that are interested in the determining the rules of game which would guarantee rights to the loser. They have to fight between themselves extremely carefully though, so as not to damage one another too seriously, but without easing up, since a too-obvious truce would not be forgiven. But for the country there is no harm in such a spectacle. Firstly, it is cheerful to watch, and secondly, a harmless democracy remains in place, no-one is harmed, so stability emerges - just as in America. Certainly, if an interloper appeared into the second second round of any voting, it's doubtful they could obtain more 6-8% of the votes. So it seems we are doomed to a two-party (more precisely - two-power) set-up, but that's fine.. Here's a portion of President Putin's speech delivered at the Munich Conference on Security Policy, February 10, 2007. "Moreover, all that we have done and are doing is designed to achieve only one goal, namely to transfer our relations with consumers and countries that transport our energy, to market-based, transparent principles and long-term contracts. I will remind you and my colleague, the President of Ukraine, who is sitting opposite from me, also knows this: for fifteen years prior to 2006, as long as we did not make the corresponding decisions during our difficult talks, deliveries of Russian energy and, first and foremost, of gas to Europe, depended on the conditions and prices for the deliveries of Russian gas to Ukraine itself. And this was something that Ukraine and Russia agreed among themselves. And if we reached no agreement, then all European consumers would sit there with no gas. Would you like to see this happen? I don’t think so. And despite all the scandals, the protection of interests, and differences of opinion we were able to come to an agreement with President Yushchenko. I consider that he made a responsible, absolutely correct and market-oriented decision. We signed separate contracts for the delivery of our gas to Ukraine, and for delivering Russian gas to Europe for the next five years. You should thank us, both Russia and Ukraine, for this decision." 'We were able to come to an agreement with President Yushchenko'....to do what? - To employ a monopolist middleman, RosUkrEnergo, to supply all of Ukraine's natural gas imports from Russia and other Central Asian countries, including Turkmenistan. RUE's website claims the company "guarantees gas deliveries to Ukraine at a price that suits the economy of this country." As RUE is a monopolist supplier, how can Ukrainian consumers be sure of this? RUE earnings are running at around $0.5Bn per month. Mykhailo Basarab in an interesting article in 'Ukrainska Pravda' provides analysis of recent events in Ukrainian politics, and explains BYuT and PoR's strategic co-operation, as highlighted by their voting together in the VR to override president Yushchenko's veto on the cabinet of ministers' law which has so reduced his powers. The actions of the two political forces could indicate that their plan is to construct a bipartisan system, in which there is no place for other parties. According to the author, there has been some signs that early elections may be planned by both political forces. Both BYuT, and Regiony have recently held gatherings of deputies of all levels. This could be co-incidence, or perhaps 'a synchronization of watches' before the beginning of battle. Crimean Verkhovna Rada Vice Chairman Vasyl Kiselev, at their meeting in the Crimea, spoke of the need for raising the voting threshold for entry into the VR to 9 - 12%. Only two political forces, those headed Tymoshenko and Yanukovych, could be sure of clearing such a threshold. I also posted recently on deputy PM Andriy Klyuyev's interview in which he stated that in the country there is a government and there is an opposition, who must co-operate. The personification of opposition, in the opinion of vice-premier, was Yuliya Tymoshenko, with whom it is necessary to conduct discussions for beneficial collaboration. A leading PoR spokesman and VR deputy, Taras Chornovil, hinted that although early elections are not likely and his party are not making preparations, but that everything is possible... And Tymoshenko never stops talking of early elections. Yushchenko's team has been stirred by these 'straws in the wind' and has no wish to be 'cut out' of Ukrainian politics alongside the Communists and the Socialists, by the two largest parties PoR and BYuT. As result, NU and Yuliya Tymoshenko's bloc have recently, perhaps slightly surprisingly, signed an agreement on common opposition activity in the VR. The author, Mykhaylo Basarab, says that for NU nothing remains but to adapt to the BYuT/PoR algorithm of a bipartisan system. If NU are to survive, then they have one choice - to go into one team with BYuT as a subservient partner, but the president and his secretariat are finding it difficult to accept that they have to 'lie down under Tymoshenko's stiletto heel'. So possibly NU, led by Yushchenko, envisages a role in the future battle between the two Titans, as a referee, or a party with a casting vote, which if necessary could separate the two stubborn giants. In other words, in this bipartisan system, NU could be a small but decisive third party. Yanuk calls PACE report "unfounded accusations"
The prime minister Victor Yanukovych has called the Parliamentary Assembly Council of Europe report on the honoring of obligations by a member state, "Unfounded accusations that are not supported by facts." He made his remarks in an interview for the Russian "Nashe Vremya" newspaper. I have posted previously on this report, which described the new Cabinet as being "top-heavy with officials who personified the corrupt fusion of business interests with the government and the manipulation of elections before the Orange Revolution period.."
Yanukovych emphasized that he is used to reasoned conversation, but "What are they blaming us for?" "As we see, is integration into the European Union, under conditions of such uncertainty in our relations, possible? Thus far we hear only generalizations, beautiful in form, but empty in meaning. So it is too early, to speak about membership, let us comprehend what is happening first. And let's not forget that questions of Euro-integration is a matter for all Ukrainians, and not only for the KabMin and President. We should ask the people, is all this necessary for them?" declared a peeved Yanukovych. When asked whether he considers the problem of Ukraine splitting up to be still topical, [often discussed in the Russian media as here] he replies: "..There is no difference between the east and the west of the country. When I was chair of the Donetsk administration, I used to come to Lviv on working visits. I didn't feel then that there was any difference, I feel no difference now. We will work to consider the specifics of the regions - there will be no problems." "We will not impose general education in Ukrainian on the Crimeans, and let us return national culture to the Galicians, and everyone will be satisfied...The Russian language has become a divisive factor with us. But this is all an artificially devised problem. We will provide regional status to the Russian language, subsequently let us think also above giving to it state status." Compare the comments made by president Yushchenko today, quoted in the article below from 'Kyiv Weekly' entitled 'President shrugs pipelines speculations', to those made by President Putin last week, and contained in my previous blog. "President Viktor Yushchenko disapproves of political speculations about the Ukrainian gas transportation system. He made this statement in his speech to public and business representatives of Germany. "There will be not a single speculation about the gas transportation system," he said. Yushchenko noted here that he did not authorize anyone to conduct talks about the future of the gas transportation system on behalf of Ukraine. "I did not mandate anyone to conduct talks about this, not at all, neither the Prime Minister nor the minister of energy nor NAK Naftohaz [Ukrainy]," he said. The President insists that it is up to the people to choose the future for the gas transportation system. "A political decision accepted by the people will go first," Viktor Yushchenko said.The president's position is that the gas transportation system cannot be transferred to other countries for management or ownership. Russia [?] had earlier made an announcement about the talks with Ukraine on joining gas transportation assets." p.s. LEvko recommends this article from 'Kyiv Weekly' which sheds light on recent developments in Ukrainian politics, in particular about how a bi-partisan system may be formed by BYT and the Party of Regions, and how possible changes to the Constitution may be made on the expansion of regional self-government. On Thursday 1st February, at his [last?] annual press conference, Putin declared that Ukraine intends to propose returning to the idea of creation of a gas transport consortium involving exchange of part of Ukraine's gas pipes though which Russia exports gas to Europe, for access to gas assets in Russia. "Regarding the creation of a gas transport consortium, we are not opposed to the idea, if Ukraine wishes to come back to this matter. We know that government experts and experts in the presidential office are currently working on this and are looking for the optimum approach to implementing this idea for our Ukrainian partners. I do not want to set off intrigue, but as is often the case, the proposal our Ukrainian friends have made is revolutionary in nature. We need to think about it, but we are interested. I would like to meet soon with [Ukrainian President] Viktor Andreyevich Yushchenko and perhaps also with the Ukrainian prime minister to discuss their proposals that are currently being examined at expert level in Russia. The proposal concerns a merger of assets. Our Ukrainian friends not only want to create a gas transport consortium but also want the possibility of having a stake in production assets on Russian territory. As a rule, we do not do this. But we have accepted this as part of the relations we have developed with our European partners, with German company BASF, for example, and it is something we are in the process of completing with E.ON. We have also reached an agreement of this nature with Italian company ENI, and so why not also reach a similar agreement with our Ukrainian partners? We just need to work out what kind of stake and which assets our Ukrainian partners are interested in, and what our companies would receive. But this is an issue to be worked out and settled at corporate and expert level. From the state’s point of view, there are no obstacles to carrying out an idea of this kind." Yanukovych also admitted there was a possiblity of transfer of part of Ukraine's gas transport system in exchange for parity participation in gas extraction assets in Russia. "We are talking of intentions at the moment. If we will start to talk of unification, then this should be at the level of partner relationship. These relations should be understood - 50-50 as they say," said Yanukovych, adding that Ukraine and Russia should develop a new model of relations in the energy sphere in order to achieve success in energy security of both countries." These statements all caused quite a furore in Ukraine, and on Tuesday the 450-seat VR, at the insistence of the opposition, voted on and approved by whopping 430 votes, a law absolutely prohibiting any change in ownership of Ukraine's gas transport system or property of Ukraine's state gas monopoly, Naftogaz. Today Yanukovych denied all the accusations that he had been selling Ukraine short, saying that talks with Russia were only about the construction of new pipelines. "We have never talked with Russia about the existing gas transport system." What was all this 'quick footwork' all about? which eventually resulted in the VR vote on the gas transport system - an unmistakable signal to Russia - 'keep your fingers out of our cookie jar'. It is unlikely that Putin lied when he made his statement about agreements with Ukrainian officials. BYuT and NU can now feel a bit better about one another, having forced through and won the vote. And PoR and the junior anti-crisis coalition members have taken the opportunity to show their pro-Ukrainian credentials too. LEvko thinks that a Ukrainian-European-Russian consortium is not such a bad idea, especially if it could be part of an international central Asia - Europe gas pipeline system. The Europeans will not been overwhelmed by the VR vote. 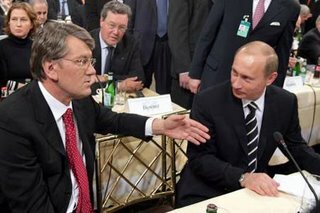 Maybe Yushchenko can explain everything to Angela Merkel in Germany tomorrow..Oh, and Putin rather dropped Yush in the doodoo.. In October 2006 Viktor Yanukovych's Cabinet of ministers hurriedly decided to place limits on the quantity of wheat Ukraine would export 2007. Quotas were applied from 31 st December 2006 and this has led to the scandalous situation described in newpapers across the world. "Ukraine's grain dumped into sea as quotas strangle exports," from FT is typical. Yanukovych has 'history' when it comes to bungling in the grain trading business, as described in an article in 'Obozrevatel'. Yanukovich, when he replaced Anatoliy Kinakh as PM in November 2002, decided it would be a good idea to earn some extra money, so he ordered the vice- premier responsible for the agribusiness, Leonid Kozachenko to sell more Ukrainian grain abroad. After several months very few reserves remained, and then much of the winter crop failed. Citizens panicked as prices in bread shops went through the roof, in several regions of the country, by February the price of flour increased dramatically. People were ready to riot, and in order to calm matters President Leonid Kuchma directed Attorney General Svyatoslav Piskun to personally sort out the situation. The Attorney General's deputy Tatiana Kornyakov decided to 'hang' the blame for the scandal on agribusiness vice- premier Leonid Kozachenko. Eventually the Yanukovych government were forced to purchase from Russia an equivalent quantity of grain to that which it had sold to the Europeans, but at an exorbitant price. Kozachenko was released after spending a month in prison. The above mentioned 'FT' article says: "The World Bank has dubbed the [export] restrictions "not justified" and upheld claims that the country's grain supply is more than adequate to cover domestic needs. The bank has also warned that the restrictions have opened a door to corruption. "The administration of the quota system so far has been highly non-transparent, and thus creates opportunities for corruption," reads a report released by the bank. Andriy Yarmak, an agriculture consultant, said many traders were surprised recently to hear that little-known companies had won big export quotas while larger foreign companies with massive stockpiles received smaller quotas. Suspicions are mounting that inside deals could be at play in the quota-granting process, Mr Yarmak said. Some companies could be selling their quotas to larger traders." Th 'Oboz' article adds most of the major Ukrainian grain traders are serious supporters of either NU or BYuT and include big names from the Ukrainian politikum. The export restrictions are intended to give them 'a poke in the eye', for it is they that will have to take a financial 'hit' for the rotten grain, and allow a few select insiders to cash in. Vice Prime Minister Andriy Klyuyev visited Brussels recently where he presented the energy policy of Ukraine in the context of cooperation with the EU at the European Energy Forum. I have posted many times previously on the dubious activities of the 42 year old Klyuyev, who now has special responsibilities for the fuel and energy complex. During the OR in 2004 he allegedly headed Yanukovych's 'dirty tricks' shadow presidential campaign, and was the main conduit for campaign funds from Moscow. There were rumours at the time that he may have been indirectly involved with Yush's poisoning. After the March 2006 elections it was alleged that Klyuyev, as PoR's bag-man, was assigned to bribe the Socialists to join the anti-crisis VR coalition; and was responsible for 'changing Yushchenko's mind' in August 2006 when the President abruptly formed the anti-crisis coalition with PoR and did not dismiss parliament as had been agreed earlier in the day with Yuliya T.
While in Brussels, he gave an interview with Radio Free Europe/Radio Liberty providing candid and lucid [but maybe rather nervous] replies in Ukrainian. The fact that he agreed to be interviewed is a surprise. Most of the PoR leadership are traditionally 'media-shy' and are reluctant to be quizzed on questions of policy. Only a handful are entrusted to do so. I would suggest that he agreed to be interviewed for several reasons. He wanted to publicize the matters of which he spoke, and also realizes that he has to show that he is not the ogre he is painted, but a serious politician. RFE/RL were pro-orange, and have traditionally espoused a pro-western world view. In his interview [a summary in Russian here ] he makes some interesting points. "At the next elections it could happen that PoR will be in opposition and BYuT in power...you probably know that we associate with the opposition political forces, and we work constructively with them...It is necessary that parties that are in opposition, and parties that are in power work together. It is not necessary to be enemies..It could happen that a two-party system will come into existence..and if we learn that the opposition and the authorities - they are partners, and not enemies, then this will be very good." I wonder if Klyuyev has stuck his neck out too far ..
Maybe BYuT and PoR really are developing some kind of modus vivendi here - simultaneously reducing or cutting out the role of the presidency. This would explain BYuT controversially voting with PoR to overrule Yushchenko's veto of the KabMin laws. NU and Yushchenko should be worried. He goes on to say that he and the PM are preparing to meet the leadership of the opposition to work through a packet of questions.. He is asked about sales of Ukrainian electricity to Hungary via Firtash's 'Emfesz' company, and promises to make sales transparent. He agrees that Ukraine will play according to 'market rules' on the trade of grain. On the EU: "We, our party, are ready to enter the EU..but we have to travel a long way in order to enter..as regards NATO, we support co-operation with NATO. After our electors in a referendum tell us that it is necessary that Ukraine enters NATO, then we will approve the political decision..but we support co-operation and partnership relations with the Euro-Atlantic alliance. We will see what the reaction to Klyuyev's statements are in the next few days. 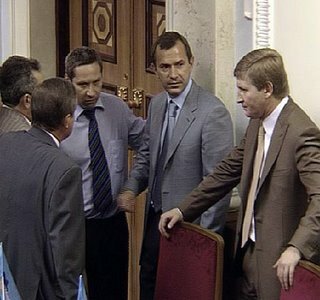 Klyuyev, second from right, plotting with Akhmetov, Kolesnikov and Kushnaryov. Only half of the Donbass population 'trust the Yanukovych government', according to an O.P. in the popular 'Donbass' newspaper. The article says that sober-minded people are usually guided by the rule which Ronald Reagan once slightly mispronounced when suggesting to Mikhail Gorbachov: "dover eye no prover eye" - trust, but check". The O.P. carried out between 12th and 28th January by the Nikolai Gavrilov analytical service, indicated that Yanuk's government is trusted by 47% of the adult population of Donetsk region. In total 929 people were questioned. A favorable opinion of the government is held by the respondents who trust it, primarily because of confidence in Viktor Yanukovych (35%), then because of the government's performance: i.e. they "try for the people" (17%). 11% said "they are delivering on what they promised". Of the respondents, who expressed a negative attitute to the activity of government, the article says "irrational motives in their assessments clearly prevailed" [hmm]. Only 15% did not have confidence personally in prime minister, and 14% did not like members of his cabinet. What slightly surprised LEvko is the high degree of trust expressed by students in [proffessor] Yanukovych - more than 2 -1 in his favour. Yanukovych responded today, during a visit to Kherson, to the highly critical PACE report which was published several days ago on the 25th of January. "I'm used to discussions on the language of facts. If there are facts, what is there to talk about? I'm prepared for discussions at any level. I'm always only interested in concrete actions," said Yanik. Ah, lucidity - its a gift the PM possesses..
And why aren't the opposition using this report - an arsenal of ammunition with which to 'bash' the Yanuk government and anti-crisis coalition? "On 11 January, the Verkhovna Rada was scheduled to elect the new [Ukrainian Parliament Human Rights] Ombudsperson. To our indignation, however, the ruling coalition parties presented the candidature of the same person [Nina Karpachova] that had discredited the independence of the Ombudsman's office in Ukraine for months. " Two quotes from a recent Oxford Business Group Emerging Markets Briefing. There is a mix of signs and opinions about which way the Ukrainian economic development is heading in 2007. However, the overall consensus is that the main story in Ukraine is still one of growth and unexplored opportunities for foreign investors. The most likely winners in 2007, it seems, however will be ground floor investors in most dynamic banking, real estate and telecoms sectors, which continue to provide the most compelling story of economic expansion." So not all bad news..